A spicy sauce made with Southern Italian tomatoes, fiery chilli and fragrant basil. 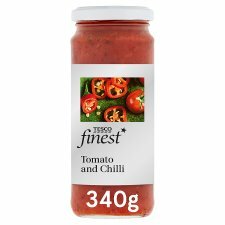 INGREDIENTS: Tomato (48%), Cherry Tomato (20%), Tomato Purée (Tomato Purée, Water), Extra Virgin Olive Oil, Red Pepper, Onion, Celery, Basil, Sugar, Red Pepper Powder(Red Pepper), Acidity Regulator (Lactic Acid), Garlic Powder, Parsley, Garlic Purée, Salt, Chilli Flakes, Firming Agent (Calcium Chloride), Oregano Leaves. Store in a cool, dry place. Once opened, keep refrigerated and consume within 7 days.